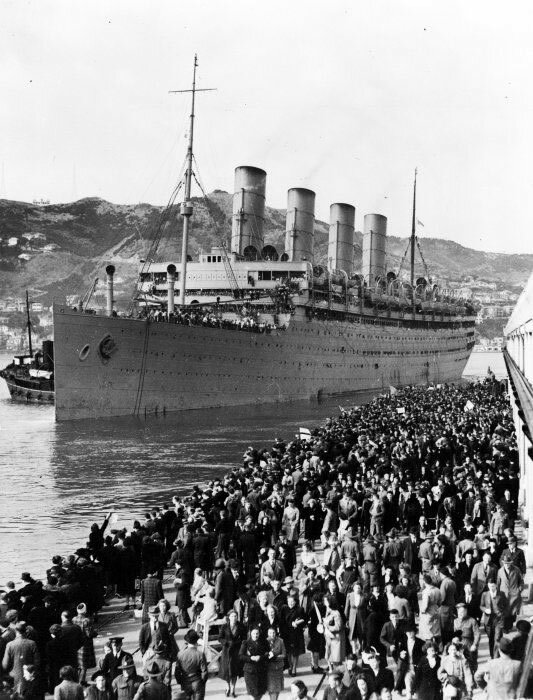 The British troop ship Aquitania draws away from Pipitea Wharf, Wellington, on 2 May 1940. The ship was carrying the main body of the 28th (Māori) Battalion and more than 2000 other men of the 2nd Echelon of 2NZEF. At the time this fast and luxurious Cunard White Star liner (45,647 tons) was the biggest merchant ship ever to have visited New Zealand. Launched in 1913, it served as a hospital ship during the First World War and as a troop ship throughout the Second World War, safely carrying tens of thousands of Allied personnel across the world's oceans. I'll be interested to know if my grandfather was on this ship. Such a great scene. I bet there were a lot of excited young men on that ship given they were about to go overseas for the first time!